In the previous chapter, a new loop paring criterion is presented to achieve the minimum loop interaction under the decentralized multivariable control. 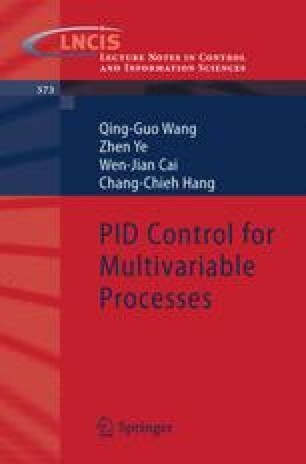 When a decentralized PID controller is applied according to the paring criterion, it should stabilize the multivariable system at first. More importantly, it is desirable to know the stabilizing ranges, not just values, of PID parameters so that the stability of the closed-loop MIMO system may not be violated in case of modeling error. This chapter addresses such a problem whose solution also leads to the concept of loop gain margin. It should be noted that the simple and effective methods to determine the gain margin of SISO systems are not applicable for MIMO systems due to the loop interactions. Hence, the new theory and/or algorithm for loop gain margins needs to be found.